The Gorkha Janmukti Morcha has announced a nine-day dharna at New Delhi’s Jantar Mantar beginning March 9 in a bid to draw the attention of the Centre to the demand for a Gorkhaland state. The directive to party leaders reportedly came on Thursday from GJM chief Bimal Gurung, currently in Guwahati to offer prayers at the famed Kamakhya temple. He is likely to return to Darjeeling on Sunday. Budget Session 2015-16 began in the two Houses of Parliament on February 23 and will continue till May 8. There will be a recess between March 21 and April 19 during which the various parliamentary standing committees will examine the demands for grants tabled by central ministries. There will be 33 sittings in total. Speaking about the dharna, the GJM assistant secretary said 105 party members will participate in the programme. “The chairmen of the Darjeeling, Kurseong, Kalimpong and Mirik municipalities along with their deputies and ward councillors will be among the participants. Twenty-one Gorkha Janmukti Vidhyarthi Morcha members will also join the event. A core committee team will be formed to lead, monitor and supervise the nine-day dharna,” Tamang said. The GJM will sit for another meeting once Gurung returns to Darjeeling to finalise the roadmap of the Delhi programme. “On March 2 we have invited the municipality chairmen, vice-chairmen and ward councillors and our youth front for a meeting. 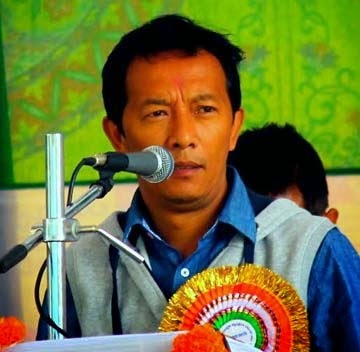 We will plan out the nine-day programme then,” said Tamang. Gorkha Janmukti Morcha has announced a nine-day dharna at New Delhi’s Jantar Mantar beginning March 9 in a bid to draw the attention of the Centre to the demand for a Gorkhaland state.